We have several updated pieces of Spirit Tracks content available for you today. We are still working hard on our Spirit Tracks Walkthrough and chapter two has received quite an upgrade and is nearly complete. Chapter two of the walkthrough covers up through the Forest Temple. We’ve also recently completed a purely text format of our walkthrough and we have submitted it to various online gaming websites including GameFAQ’s. Here at the site though, we have several other new or upgraded pieces of content. Our Spirit Tracks Boss Guide is now nearly complete with images for just about all the bosses. Additionally, our Spirit Tracks Enemy Guide has been updated with several higher quality images and the inclusion of more of the enemies found. Lastly, we have a brand new piece of content in the Spirit Tracks Force Gems page at the site. There are 20 Force Gems in the game and each gem that you collect will restore a new section of the Spirit Tracks allowing you to reach hidden train stations, find new rabbits, and acquire new items and heart containers. This page is still a place holder page and we plan on improving on it over the coming weeks. 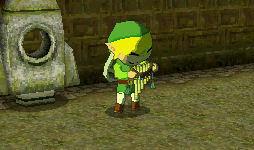 Be sure to check back at Zelda Dungeon over the next few days as we continue to add fresh new Spirit Tracks content.